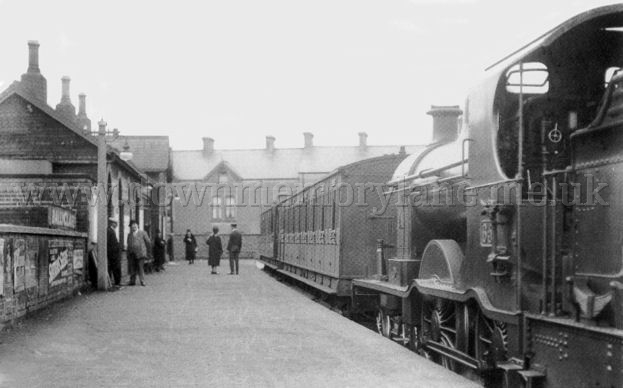 This is Ballyclare station on the 9th August 1930 and No.65 engine is ready to move off at 7.45 p.m. to York Road Station, Belfast. 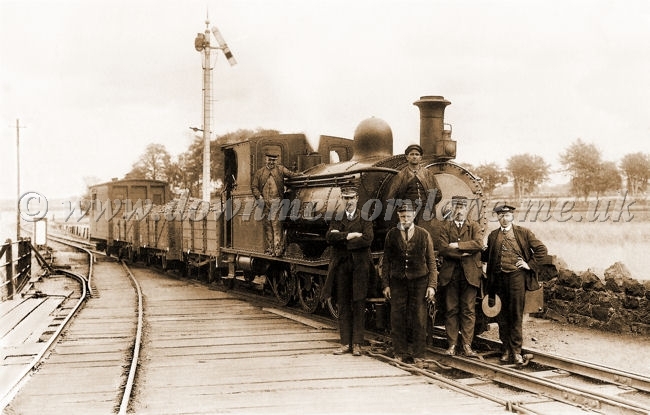 The locomotive is a NCC Class A1 4-4-0 and was built by the Midland Railway in 1903, then rebuilt in 1929. 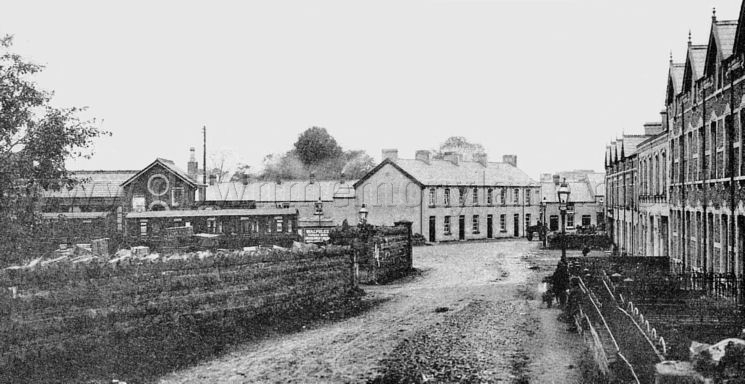 Here you can see the entrance to Ballyclare Railway Station, the year is unknown. There must have been a pigeon race lately for you can see on the platform lots of empty pigeon wicker baskets. Just look at the road no tarmac then, in the foreground is a boy with possibly a sibling on a bike next to him and in the distance a horse and cart going away. This RBP 318 Burnside parading through Ballyclare and in the foreground is Harry Scott. 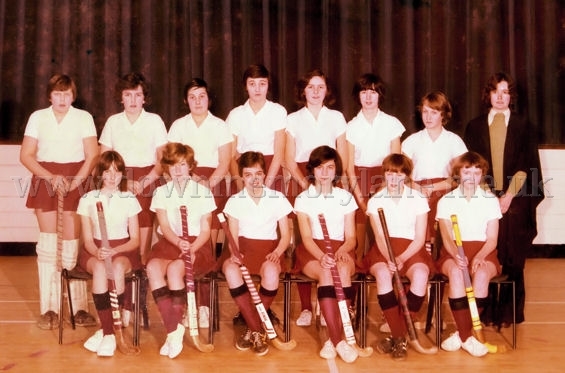 These are the pupils and teacher of Ballyclare High School's Hockey team. Sadly the year and their names are unknown to me. It's 1920 and even though the signal says go the engine is stopped for a photograph to be taken this coal train with a guards van is on the Six Mile Water bridge and is just at the entrance to Ballyclare Station. The engine has a single, central buffer and is No. 103 with the name 'The Bruiser' and was a regular on this run. It is a narrow gauge railway and in 1930 they stopped taking passengers and then goods in 1933, but still continued to operate carrying pulp and coal to the paper mill until the works closed in 1950. On the engine is the train driver D. Warwick who has turned on the steam release valve to let the steam flow out. Then we have the Station Master W.J. Orr, next to him is the stations porter T Marshall, behind him on the front of the engine is the Fireman S. McCullough. Then we have R Ireland who is the guard of this train and finally the other train driver J. Stewart. please let me know and I will send you a copy without the watermark. 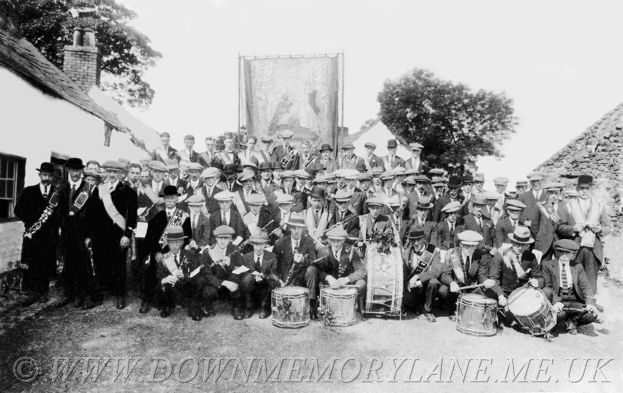 It's the 12th July 1923 and being photographed her is the village band Ballyeaston Flute Band along with the Orange Lodge 1010 before setting off to the 'field'. The band was formed in 1892 and in 1923 shared a hall with the lodge which is the building to your left. 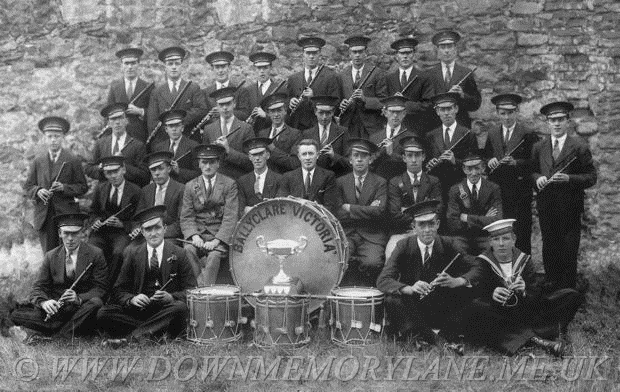 In the mid 1930's a new Orange Hall was built on the road to Ballyclare and the old hall was sold to the band. The band was very successful in championships until its demise in 1965. The bandroom still exists, with a commemorative plaque on the outside wall. It is now unoccupied and held in trusteeship. Many Ballyeaston folk can be reconised here including the Millar brothers, Bob and Johnny, prominent in the front row wearing soft hats. Bob was a well known tailor for many years in Ballyclare. 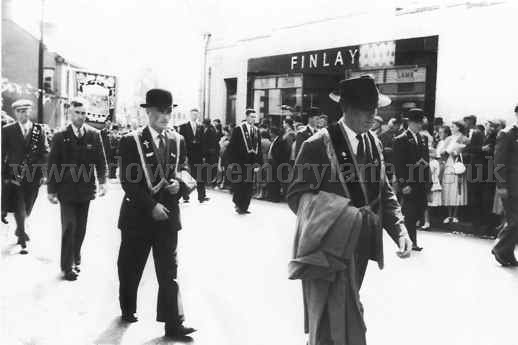 If you know anyone else in the photograph, please let me know and I will send you a copy without the watermark.